CO2 Guns are great for crowd interaction with DJs & an easy flexibly CO2 effect for small venues. Our CO2 guns are designed by us here in the UK & offers a incredible visual effect by producing an 8m white cryogenic fog plume. 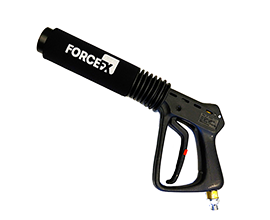 The ForceFX CO2 gun is lightweight, and extremely easy to use requiring no external power. This stunning, repeatable effect is perfect for DJ’s, dancers and any type of high energy performer. These are great fun to use & can create an exciting and unexpected effect on stage. Our Co2 guns are popular with both artists and DJ's, and have been used to great effect from Ibiza festivals to local clubs.